Let us pray for the peace of Jerusalem and for the entire Middle East … that the unwise decisions of political leaders not increase the suffering and violence that have already plagued the lands once touched and visited by God, the Lord, the Apostles and so many holy men and women of our traditions. Jerusalem is the city where the joys, aspirations and pains of humanity converge. It is the city where dreams are dreamt and either realized or shattered. A well-known medieval map shows Jerusalem and Solomon’s Temple at the center of the world, the continents of Europe, Africa, and Asia fanning out from the center like gigantic petals. It is a vision of world redemption arising from Jerusalem. Jerusalem is the heart of the world and the center of history. The history of salvation revealed in the Bible is situated between two visions which form the beginning and the end of the human drama: The vision of paradise lost in the book of Genesis and the vision of the new Jerusalem which descends from God in the book of Revelation. We come from God, and we return to him. These two visions are the two beacons which shed their light on everything that comes between them concerning the history and fate of humankind made up of human suffering and joy. Jerusalem, as a symbol of the land itself, is called holy and the city is a symbol of the assurance of the saving power of God: “Just as the mountains are around Jerusalem, so the Lord is round about His people” (Psalm 125:2); “May my tongue cleave to the roof of my mouth if I forget you, if I do not consider Jerusalem my greatest joy” (Psalm 137:6). No one better anticipated Jerusalem’s future than Isaiah, the eighth-century Hebrew prophet-poet. After predicting the world’s destruction, Isaiah located his messianic vision of future redemption in Jerusalem’s hills (Isaiah 2:1-5). He prophesied that one day all the nations will end their warring and gather in final reconciliation on the highest hill, the hill called Zion (Jerusalem). From Zion, the “mountain of the house of the Lord,” the divine Law of Justice will come forth. The Gospel of Luke and his subsequent account of the early Church in the Acts of the Apostles depicts Jerusalem in a highly positive manner. Luke’s Gospel begins and ends in the Temple of Jerusalem. The opening scene depicts the announcement of the forthcoming conception and birth of John the Baptist to Zachary, John’s father, a priest who by lot entered the sanctuary to burn incense (Luke 1:10). The Gospel closes with the disciples of Jesus celebrating in the Temple each day as they await the outpouring of the Spirit on Pentecost (Luke 24:52-53). There are other indications in early Christian Scriptures and writings of the great spiritual significance of Jerusalem. Paul’s reaching out to the Gentiles with the message of the Gospel included a constant appeal for the “poor” of the Church in Jerusalem and Judea. It was intended to symbolize the solidarity of Church members of Jewish and Gentile origins. For Paul, who contrasted the Jerusalem below and the Jerusalem above in his epistle to the Galatians, Jerusalem remained an important anchor and reference point. Jerusalem is the City of God, God’s sanctuary, the place where every believer — Jew, Christian or Muslim — has heard the Word of God, and because of that, wishes to adore God. This religious necessity is also an essential part of the human, individual and collective identity: It consists of persons and a people. The religious memory is also a national memory for the Jew and the Muslim in particular. For Christians, Jerusalem was and remains the Mother Church, the birthplace of the first Christian community. I conclude with this prayer written by Jesuit Cardinal Carlo Maria Martini, which appears in his book “Due Pellegrini per la Giustizia” (Centro Ambrosiano: Edizioni Piemme, 1992). I have prayed these words often during my years of study in both Rome and Jerusalem. 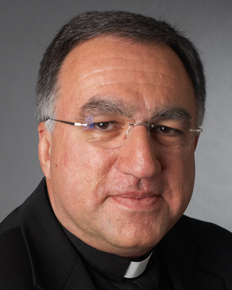 Basilian Father Thomas Rosica is CEO of Salt and Light Catholic Media Foundation in Toronto, Canada. PREVIOUS: Babysitting grandmom overcommits to her daughters; now what?